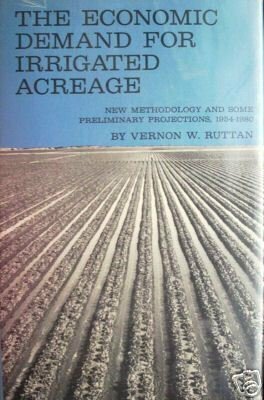 The Economic Demand for Irrigated AcreageNew Methodology and Some Preliminary Projections, 1954 - 1980 Vernon W. Ruttan Book Condition: Hardcover is firm and hinges are not cracked or damaged. Pages are tight and clean. Boards have light shelfwear and rubbing to edges. DJ protected with mylar and not clipped. Retired library edition has usual marks and attachments. Pocket removed. 139 indexed pages. From the inside flap: More than 90 percent of all the water used in the western United States is for irrigation. Because of the increased competition for water, it is important, in planning further irrigation, to know the actual economic demand for such water use. In some areas of the country conflicts have already developed between irrigation water use and other water uses. SKU: 0107110121Visit my eCRATER Store for other great books and save on shipping! FREE DOMESTIC SHIPPING on orders over $25 when you buy other eligible items!Most books have shelfwear and cover scuffing. Binding is tight unless otherwise noted. If additional information is needed about condition,please ask for a more detailed description. We receive books from many sources and cannot guarantee against pet, perfumeor smoke smells. If this is a concern, please email and we will be glad to check the individual book.All prices are in US dollars.We use actual photos when possiblesince stock photos may be different from our copy.The information provided by eCRATER licensed through MUZE is not always correct and is only provided as a courtesy. If there are any differences, our input is the correct information.DOMESTIC SHIPPING: Most shipping is by Media Mail with delivery confirmation. Discounts available for multiple books that are paid for in one transaction. Priority and Express mail available. Email for details.INTERNATIONAL SHIPPING: We ship worldwide for actual postage plus $1.75 handling per order. International buyers must contact me for final costs before making payment.Pay me securely with any major credit card through PayPal!